At Google I/O 2018, Google announced a new way to present UI templates that can display rich, dynamic and interactive content from your app within the Google Search app and, later, in other places such as the Google Assistant. Slices can help users to get information or take instant action outside of an app screen. Slices make your users re-engage with your app in a relevant context. 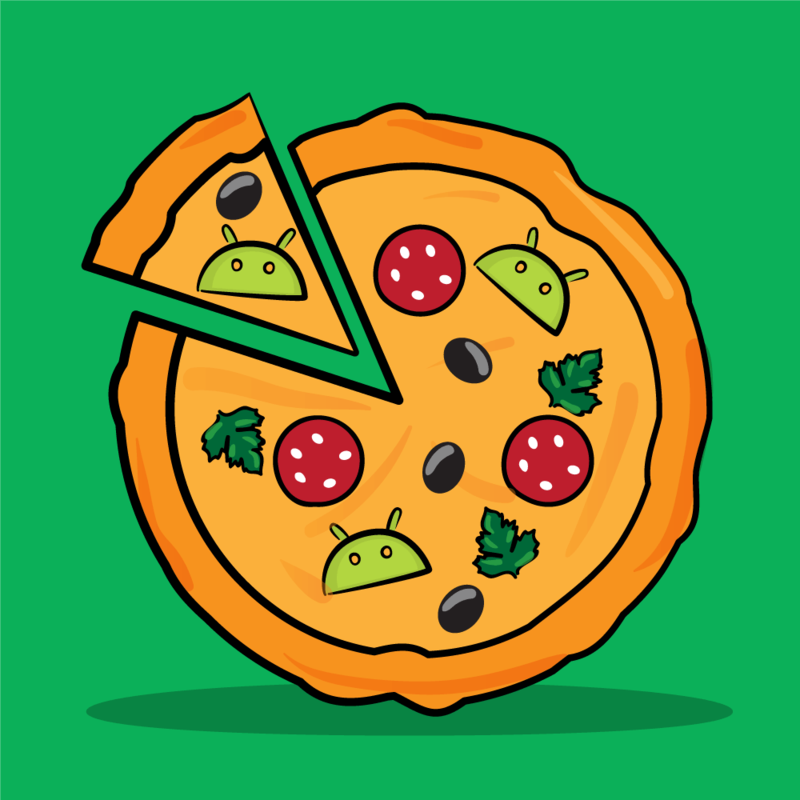 Slices are built into Android Jetpack and can extend all the way back to Android Kitkat API 19. Slices are in beta release at the time of writing this tutorial, but you can get started developing with them today! 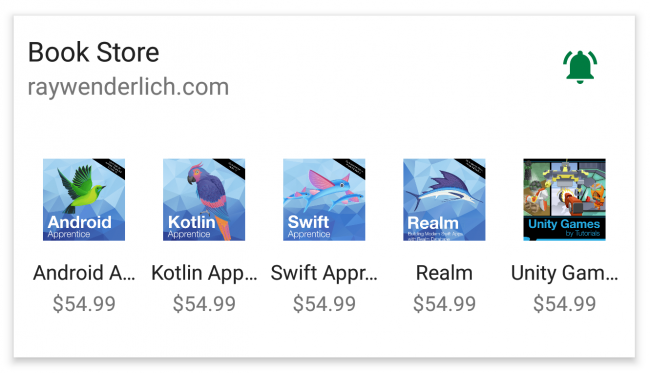 Prerequisites: For this tutorial, you need basic knowledge of Android programming and familiarity with Kotlin and Android Studio. Knowledge of content providers and URIs is helpful but not required. 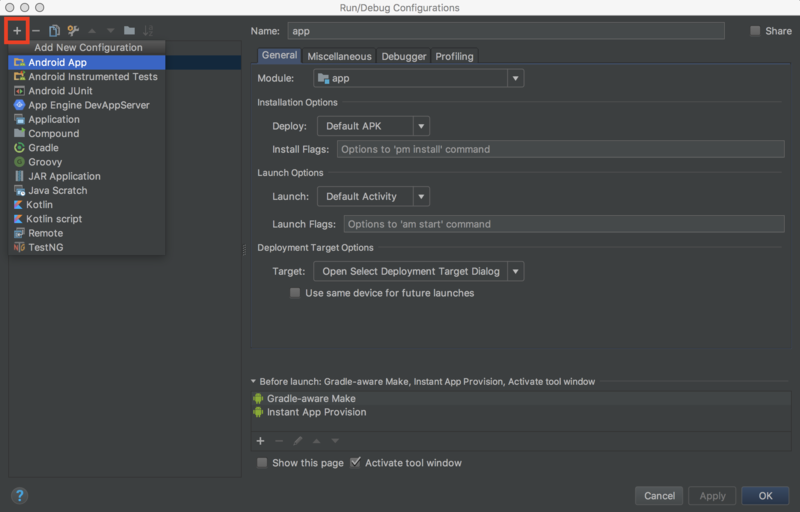 If you’re completely new to Android, you might want to first check out Beginning Android Development Part One. 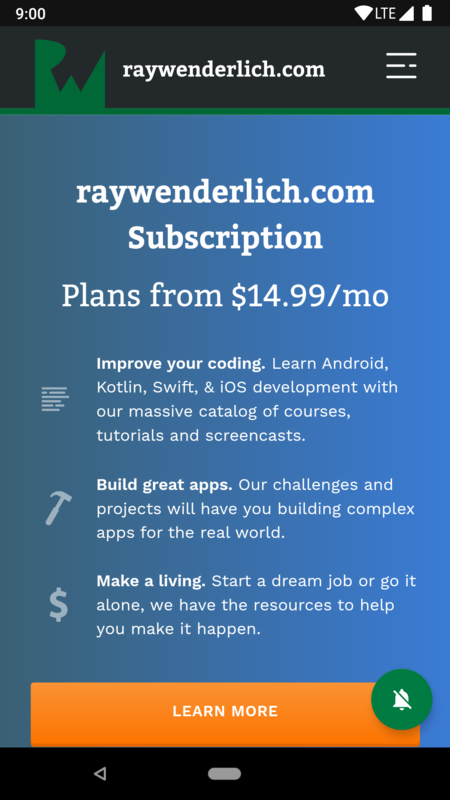 If you need to catch up on Kotlin, you can check out Kotlin for Android: An Introduction. 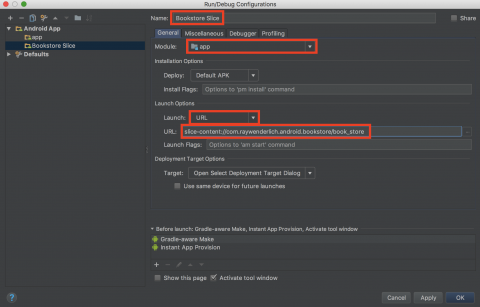 To follow along with this tutorial, you’ll need to use Android Studio 3.1.3 or later and Kotlin 1.2.30 or later. Start by downloading the materials for this tutorial using the Download Materials button at the top or bottom of this page. Fire up Android Studio and import the starter project. For the most part, you will create your own classes. You will need to find AndroidManifest.xml to add code, so make sure you can locate that. 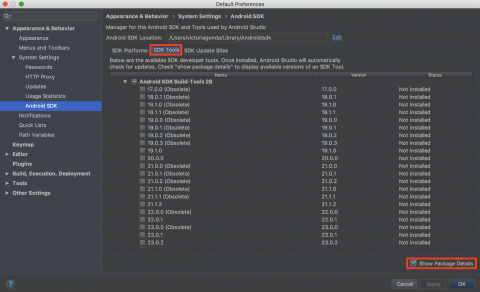 If you have not downloaded the SDK for Android API Level 28 previously, you’ll have to do that to run the app. 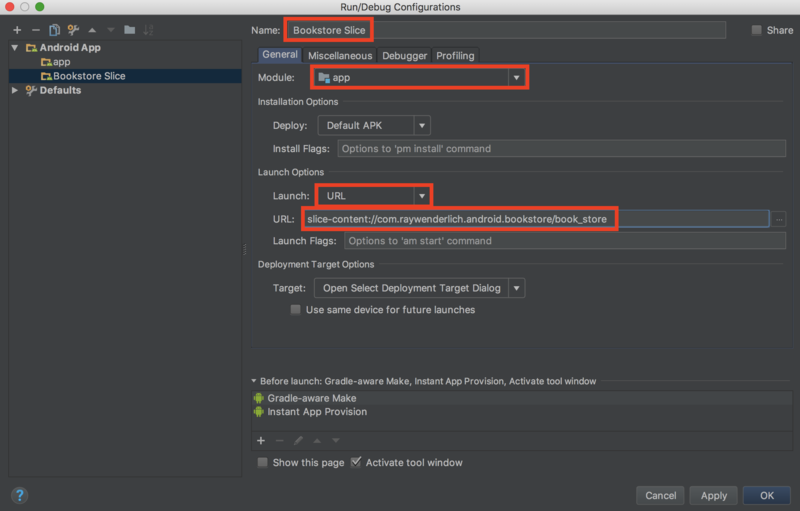 If you already have Android API 28 set up, you can skip the following four steps and go right to building and running the app. 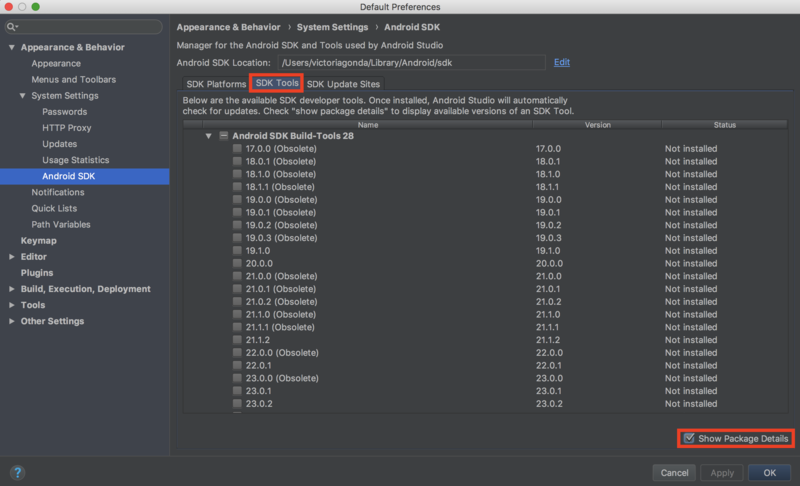 Select Tools ▸ SDK Manager, or click the SDK Manager icon in toolbar. 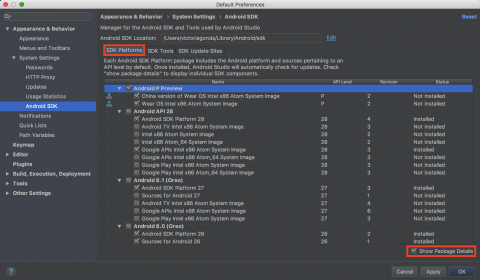 In the SDK Platforms tab, select Android API 28. You may need to select “Show Package Details” to see it. 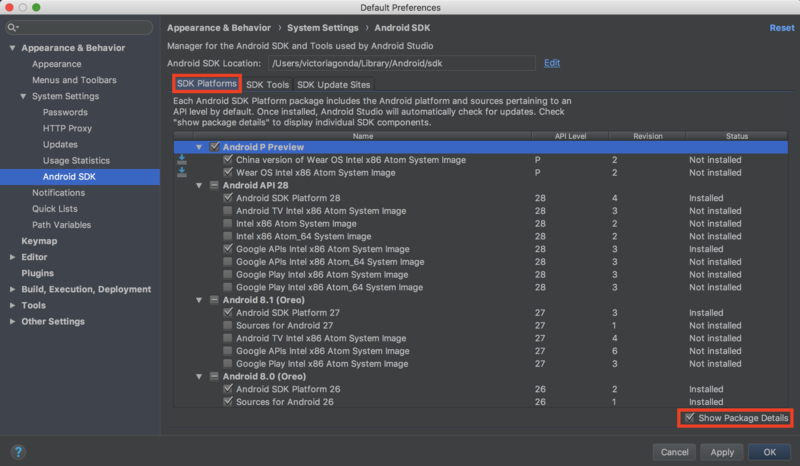 In the SDK Platforms tab, select Android SDK Platform 28. Click OK to begin install. Once the SDK is installed, build and run the app. It is a bookstore app, and it shows the available books on https://store.raywenderlich.com/. Slices need a viewer or presenter to display their content. The Google Search app is one of the suitable presenters to show your Slice template. When the user types a word in the search bar, the Slice you’ve created might present related information to the user’s search keyword. For example, if the user types words such as “ride” or “ride car,” Slices from installed apps like Careem or Uber could show to let the user request a car even without opening the corresponding app; that full experience can be achieved by App Actions and Slices. Bear in mind that presenters may make a light customization to your Slices to match their design requirements, e.g., font style, font size and/or colors. Icons in your Slice, for example, will be tinted with the accent color of the presenter app. 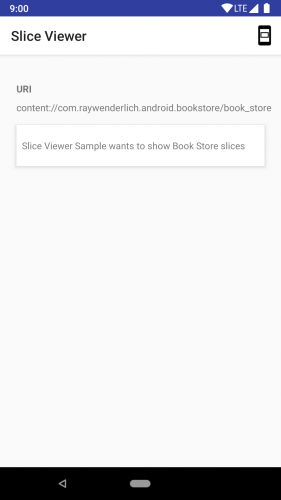 You will use a Slice Viewer app to display the Slice from your Bookstore app. 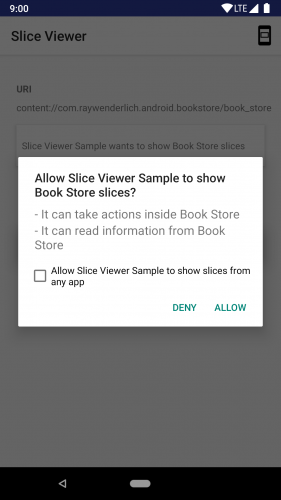 The Slice Viewer app uses your slice Uri to view it on what’s called its surface, and on a first time request of your Slice, the user will be asked to grant a permission to the viewer. 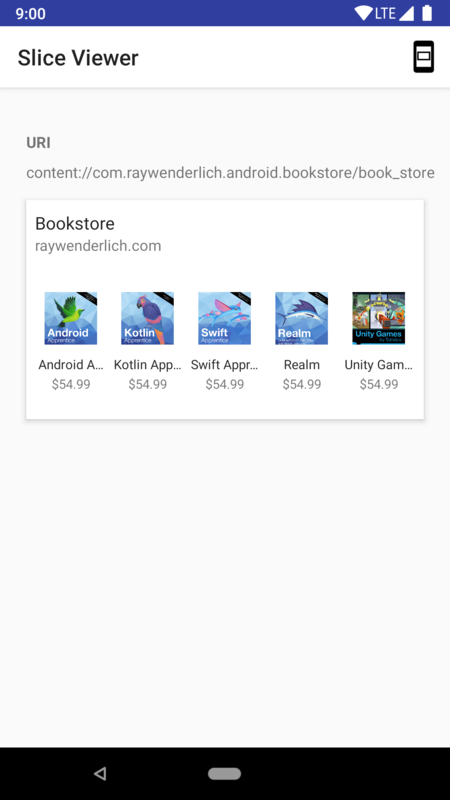 Create a new Kotlin class named BookstoreSliceProvider and make it inherit from the androidx.slice.SliceProvider class. Use the androidx option if available for any imports that you need to add for the rest of the tutorial. The SliceProvider class is your only way to expose your Slice to other apps, and it decides which Slice will be exposed to the viewer. The SliceProvider class is a subclass of the ContentProvider class. Content providers are one of the primary building blocks of Android applications. They encapsulate data and provide it to applications through the single ContentResolver interface. You can use content providers if you need to share data between multiple apps. For example, Contacts data is used by multiple apps and is stored in a content provider. Learn more about content providers from here. const val BOOKSTORE_PATH = "book_store"
Implement onCreateSliceProvider() to initialize your Slice provider on startup. Do not put long running operations here or your app launch will be delayed, and the first Slice that binds with the viewer will be delayed, too. Return true if the provider was successfully loaded, false otherwise. Create your Slice inside the body of onBindSlice(). You should create and return your Slice as quickly as possible. If you want to make network requests or I/O operations, do so in the background to keep your Slice UI responsive. If your background operation is done and you want to update your Slice with the new data, call contentResolver.notifyChange(uri) with the Slice URI, and Android will invoke onBindSlice() for you. Get the path from the URI. Check if that path is the path of your Slice and return the bookstore Slice if true. Return null in case you have no Slice for this path. Create a String constant as a bookstore path. 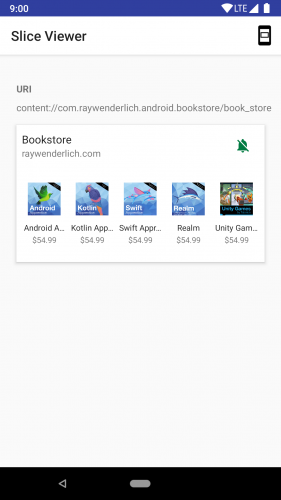 Slice providers must be registered in the app Android manifest, so declare BookstoreSliceProvider in the AndroidManifest.xml file as a child of the application element. You’ve marked the Slice provider as exported so that it is made available to Slice viewers. Slices are list of rows that are constructed using a ListBuilder, a type of SliceBuilder. At the time of writing of this tutorial, Android provides five different Slice builders to build different types of rows with different designs and functionalities: HeaderBuilder, RowBuilder, GridRowBuilder, RangeBuilder, and InputRangeBuilder. ListBuilder as the main builder of your Slice. HeaderBuilder to set a header with title and subtitle. GridRowBuilder to add a row of cells. CellBuilder to add a cell; each cell has an image, title and text. Construct a ListBuilder by passing a context object, the Slice Uri and the lifetime of the content in this Slice. For your case, pass ListBuilder.INFINITY for the lifetime to make the content live forever. ListBuilder is the first builder you need to use to start building a new Slice, and it allows you to add different types of rows that are displayed in a list. Set a HeaderBuilder to display a header as a first row in your Slice template. HeaderBuilder allows you to add title, subtitle, summary subtitle and/or primary action to the header. Set a subtitle and summary for the header. Set the primaryAction for the header. 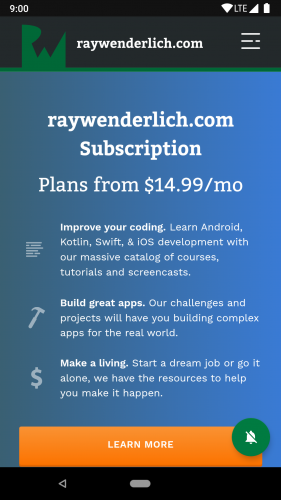 Call the build() method to build your Slice. You neeed to set up a run configuration to show your Slice on the top of the viewer surface by launching the Slice Viewer app using your Slice URI. 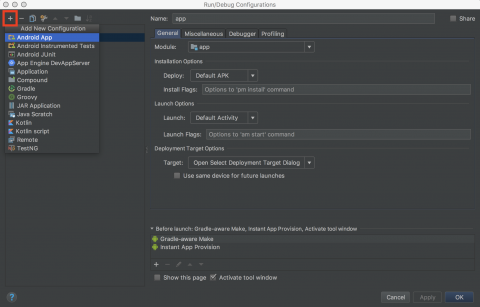 In Android Studio, select Run ▸ Edit Configurations. In the top-left corner, click the Plus button and select Android App. Enter Bookstore Slice in the Name field. Select your app module in the Module dropdown. Under Launch Options, select URL from the Launch dropdown. Enter your Slice URI in the URL field. Note: The Slice Viewer app can show your Slice if and only if it has permission to access your Slice URI. Get the books list from the data store. For every book in the list, add a new cell to the row. 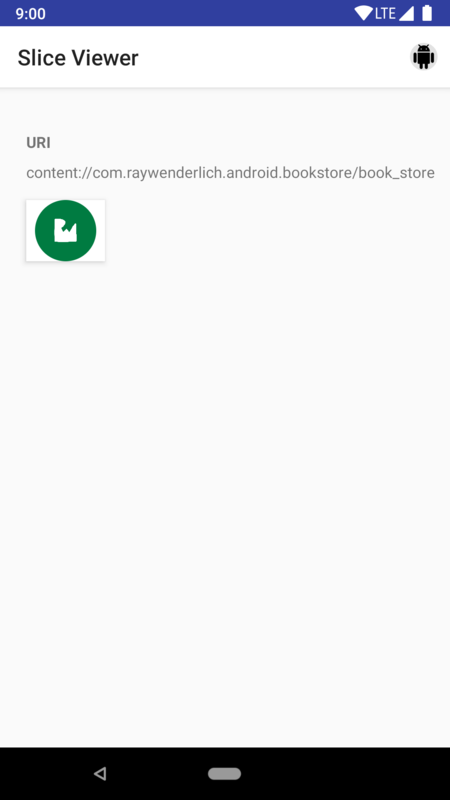 Add the book cover as an image to the cell. Add the book title as titleText for the cell. 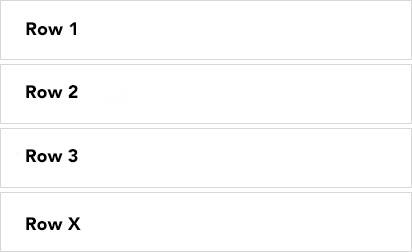 Add the book price as text for the cell. Set the PendingIntent to be invoked by the primary action if the user taps on this cell in the row. 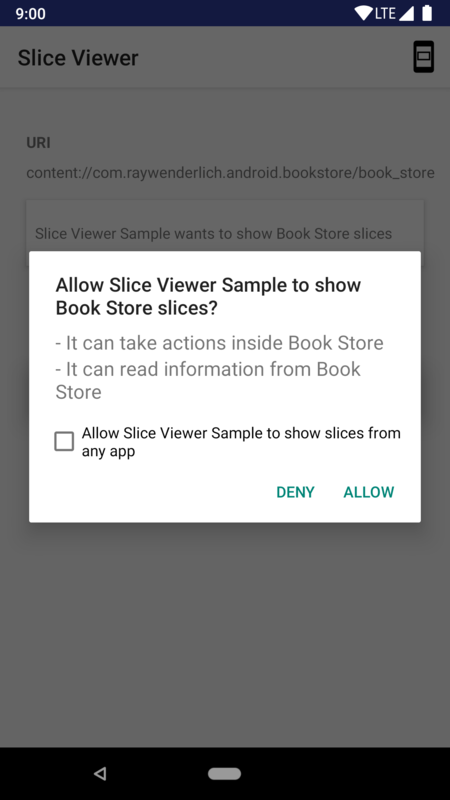 You can add a notification icon to your Slice to let users enable or disable notifications from your Bookstore app. Add this addAction() before .build(), and add the getToggleNotificationAction() to the class. You’ll create a the BookstoreSliceBroadcastReceiver in a moment. Add a SliceAction to the ListBuilder. Get a pendingIntent from a broadcast receiver called BookstoreSliceBroadcastReceiver. This broadcast receiver handles broadcasts when the user taps on the notification icon in your remote Slice. Get the notification icon resource ID based on the notification state (enabled or disabled). Create and return a new SliceAction with three parameters (pIntent, actionIcon, actionTitle). Note: To send and receive data from your remote Slice to your app, you need to create a BroadcastReceiver! const val ACTION_TOGGLE_NOTIFICATION = "com.raywenderlich.bookstore.ACTION_TOGGLE_NOTIFICATION"
Implement onReceive() to receive broadcasts. Get the action of the received broadcast. Check if the action is equal to your ACTION_TOGGLE_NOTIFICATION. Get the URI of the Bookstore Slice. Notify the URI to update all of the presented Slices. Create an action string constant to use with the toggle notification broadcast. Create a method to get a PendingIntent to toggle the notification. Create new intent for BookstoreSliceBroadcastReceiver. Set the intent action to ACTION_TOGGLE_NOTIFICATION. Return a broadcast PendingIntent with the intent you just created. 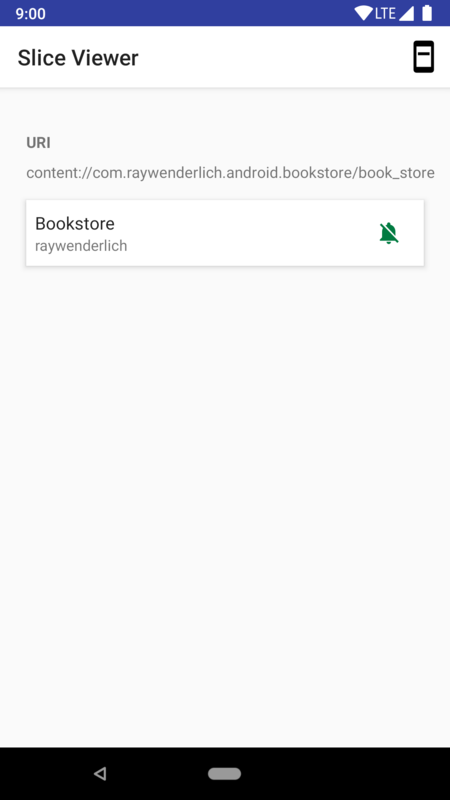 Next, declare BookstoreSliceBroadcastReceiver in the AndroidManifest.xml file as a child of the application element. Try to enable the notifications by tapping on the notification icon in your Slice; doing so will broadcast the notification toggle action to the BookstoreSliceBroadcastReceiver. The icon in the primary action, which will be displayed in the shortcut mode. Any icons in your slice. Widgets: Switch, SeekBar and ProgressBar. Large: The whole slice will be displayed. Small: Only the header of the slice will be displayed. 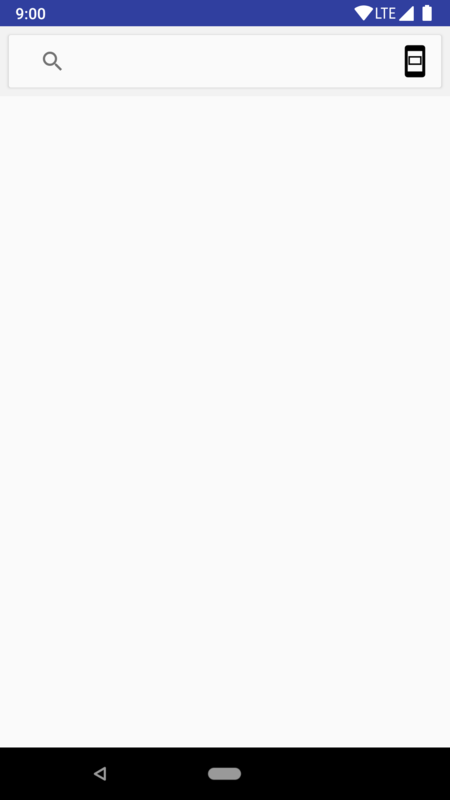 Shortcut: Only the icon of the primary action of the header will be displayed. You’ve aleady made your Slice compatible with the three modes by adding the following a summary to the Slice header within the apply block. The summary will be shown in the small mode instead of the subtitle. Note: If you have not set a header to your ListBuilder, the first row added to your ListBuilder is displayed instead. Build and run in the Slice Viewer app. 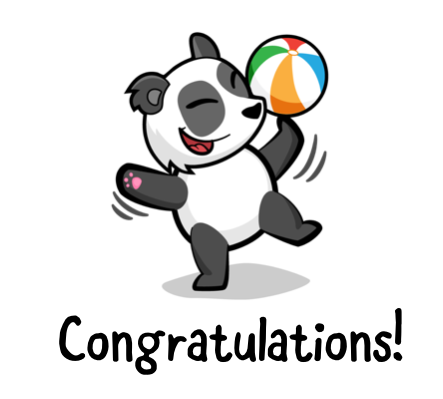 And with that, you have finished your Slices tutorial! You can download the completed project using the Download Materials button at the top or bottom of this tutorial. Note: You’ll need to complete the instructions in the Slice viewer and Let the Slice viewer show your Slice sections to be able to run the final project. Create a Slice for a bookstore app. Show the Slice on the surface of the Slice Viewer app. Make the Slice interactive by adding a notification icon to let the user enable or disable notification without opening the app. Make the Slice compatible with the different display modes. Update the Slice with new data. You may also find it helpful to learn about RangeBuilder, which you can read about here. And since Slices are a way to enhance App Actions, you may want to know more about App Actions, which you can learn about here. Feel free to share your feedback or ask any questions in the comments below or in the forums!